Thanks to Prime Six for this recommendation. Brief Synopsis – Two friends try to rob a bank and when things get out of control, they end up with a hostage situation with no way out. My Take on it – This is a great film that works on numerous levels almost the entire time. The fact that it’s based on a real situation that happened a few years before the film was made helps make this story even more powerful to watch. The acting by Al Pacino, John Cazale and Charles Durning is amazingly done and each of them helps us believe that these are real people involved in this incident. The story moves along at a great pace despite the fact that it all takes place in one place. Director Sidney Lumet is able to keep things interesting and thrilling the entire time with a minimal cast and minimal locations. This film brings up some great issues that are still relevant today. This film is a superb example of a situation that is completely wrong no matter how you view it despite being done for the right kind of reasons. The dialogue between the characters is quite powerful and it helps present us with a more intense and intelligent debate of what is going on. Bottom Line – Great story that works most of the time. 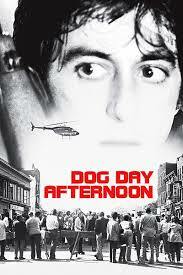 Pacino, Cazale and Durning are all amazing here. Loved the way the story moves along at a great pace despite the fact that it all takes place in once location. Director Lumet does a wonderful job keeping things interesting and exciting the entire time. The issues brought up are still somewhat relevant and this is a great example of something that is done for the right reasons despite it being wrong no matter how you look at it. The fact that this is based on a true story makes it even more powerful. Highly Recommended! Excellent film. Crazy thing – I just started watching a series called Mindhunter – about the advent of the FBI’s serial killer psychological unit being formed – and in the 1st episode – where a hostage negotiation class is being taught – they show the class DOG DAY AFTERNOON – and point out how you do and don’t negotiate in a hostage situation. You hit all the high points of the film – of which there are many (“Attica!! Attica! !” – this scene is actually “borrowed” by John Travolta in “Saturday Night Fever”). I might also add – that when you speak about what a great job Sidney Lumet does “…despite the fact that everything talks place in one place” (actually it doesn’t – there are scenes in different rooms in the bank, on the street, at his “wife”‘s apartment, in cars etc.) – Lumet started his film career brilliantly (after a very distinguished career as an actor and a director in the Golden Age of live TV in the 50s) with the film “Twelve Angry Men” – which other then the brief opening in a courtroom and closing on the courthouse steps – literally DOES take place in one room – the jury room – as the 12 men deliberate the fate of a man after a trial that we never see. It’s fantastic.